Most new crust forms at ocean ridge crests, is carried slowly away by plate movement, and is ultimately recycled deep into the earth—causing earthquakes and volcanism along the boundaries between moving tectonic plates. Oceans are continually opening (e.g., Red Sea, Atlantic) or closing (e.g., Mediterranean). Because continental crust is thicker and less dense than thinner, younger oceanic crust, most does not sink deep enough to be recycled, and remains largely preserved on land. 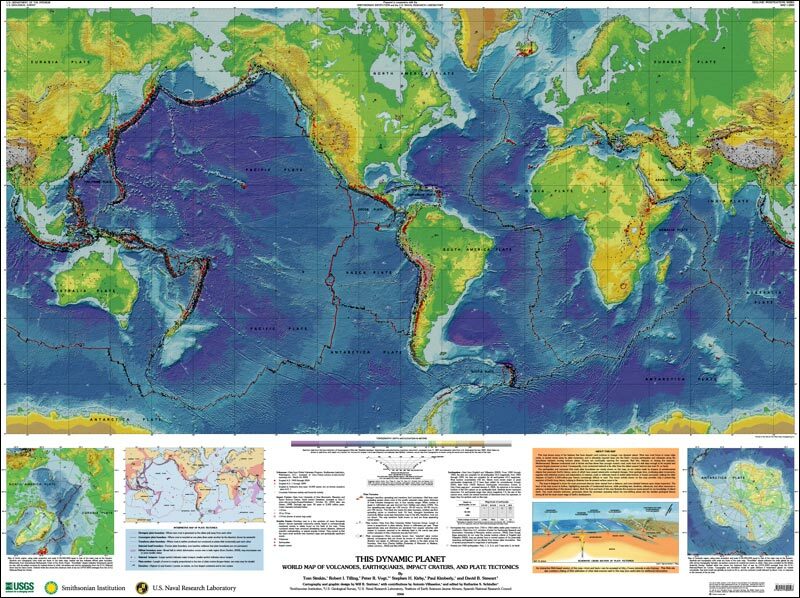 Consequently, most continental bedrock is far older than the oldest oceanic bedrock (see back of map). Sections of the map suitable for printing were created as PDF files when this map was first published in 2006. These files are no longer available because they do not meet Smithsonian accessibility compliance requirements. However, free full-sized PDF files of the front and back of the map are provided by the USGS Store. Due to the large size, we recommend downloading them rather than opening them in a browser. This Dynamic Planet is now accessible to a wider public thanks to a collaborative project initiated in 2009 between the authors, the Geological Survey of Canada (GSC), and the Canadian Space Agency (CSA) that led to the translation of the text on the map to French. The project was supervised by Alain Berinstain, Director for Planetary Exploration at the CSA, and coordinated by Marie-Claude Williamson, research scientist at the GSC (Ottawa), The translation files are accessible from links on the Printable Pages tab. For ease of correlation, we suggest that you start with the "Back of Map" section, then select the panel of interest. Cette planéte dynamique est désormais accessible à un plus vaste public grâce à un projet collaboratif initié en 2009 entre les auteurs, la Commission géologique du Canada (CGC) et l'Agence spatiale canadienne (ASC) dont le but était de traduire les textes de la carte en français. Le projet fut entrepris sous la direction d'Alain Berinstain, Directeur de la Division d'Exploration planétaire à l'ASC, et coordonné par Marie-Claude Williamson, chercheure scientifique à la CGC (Ottawa). Les fichiers de traduction sont accessibles à partir des liens de la section Printable Pages. Pour faciliter la corrélation entre les textes, nous vous suggérons de débuter à la section "Back of Map" et de sélectionner le champ d'intêrêt. This page contains data that generated the printed and web versions of this map in 2006, not current data. All files are in tab-delimited text format. Volcano data are sorted by volcano number used in Smithsonian data files. Earthquake data are loosely sorted first by magnitude range, then by date. EQs >=5.5 from Engdahl & Villaseñor (2002) and those <5.5 from Engdahl (personal communication, 2003). Earthquakes that occurred from 1750 to 1960 within stable plate interiors on continents. Data are from A.C. Johnston (Center for Earthquake Research and Information, University of Memphis, written communication, 2002). Impact crater data are sorted alphabetically by crater name. From University of New Brunswick/GSC database. Plate boundary data were plotted by Peter Vogt, Steve Kirby, and Paul Kimberly, based on data from DeMets (2002), Bird (2003), and other scientific literature. They are in lat/long ASCII text line files. Web-based data sources, plus recommended sites for additional information. 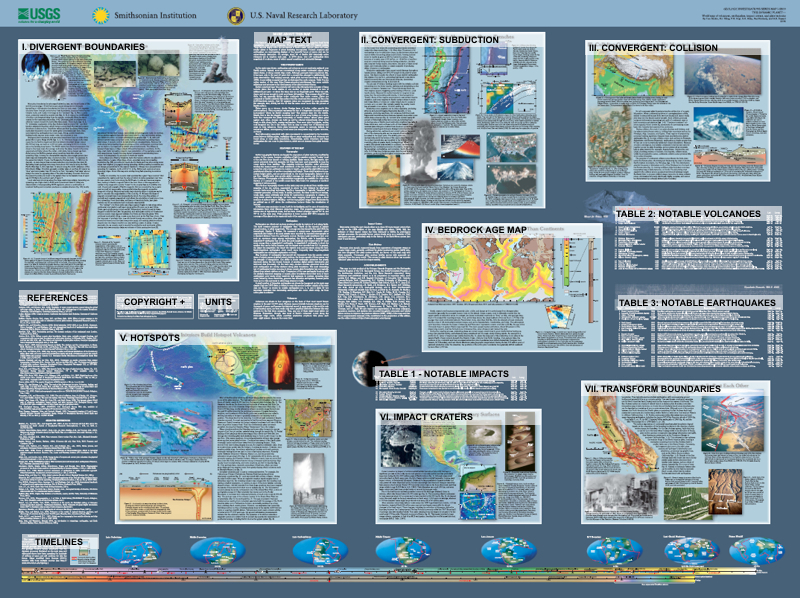 The two-sided map sells for $9.00 per copy and can be ordered from the USGS Store. Shipping and handling fees may also apply. Visitors to the National Museum of Natural History, 10th and Constitution, NW, in Washington, DC, may purchase maps from the gift shop. For continuing support, understanding, and help - through the 5 long years of this project - we owe great thanks to our spouses. We also express our appreciation to the many colleagues, geoscience teachers, and students who provided thoughtful comments and helpful advice on how to improve the previous editions (1989, 1994) of our map. Affiliations are those at time of contact, largely 2002-2003, and principal author contact for each helper is identified by initials in column to right. Index Map: Toggle on/off. Shows selected area with respect to full map. Zoom In (default mode): Drag cursor from one corner to another of the desired area or click on the center of the desired area. The map that is returned may not be the same shape. The maximum dimension of your rectangle is retained, and "bonus" area is added to give default square. In order to get a non-square shape, change the size/shape of the browser window before zooming. Some graphics (e.g. Notable numbers) continue to scale when zooming in and appear very large with respect to surrounding data. Zoom Out: Click anywhere on map to zoom out by increments. Zoom out to full size by drawing a small box. Pan (hand): Drag cursor in direction you want map area to shift. Identify: To get data on a specific symbol, select its layer (from list at right margin) then click on symbol of interest. See below for explanation of data. In some cases the pop-up blocker must be disabled in order to view the "identify" results. Get X-Y: Click on point of interest for its decimal latitude and longitude, N and E are positive (+) and S and W are negative (-). Legend/Layers: Toggle to legend (for the best quality, print the main map legend via "printable pages."). To include (or exclude) a layer when constructing a map, check (or uncheck) that layer's box in the "Visible" list then click the "Refresh Map" button (most layers are visible by default). Unfortunately, earthquake depth groups cannot be selected as a layer independent of magnitude. Print/Save: Opens a new window with the option to either print or save the current map view. Printing via the browser's print function has mixed results. On Windows machines you can also print the current view by selecting "Alt - Print Screen" and then pasting into an image processing program. Click on map or section of interest. To zoom in, select the "+" symbol at the bottom of the page, or click and drag the triangle above the "+" and "-" symbol controls to fine tune. Once zoomed in, navigate by selecting the arrows or dragging cursor. Zoom out by "-" symbol. Some are difficult to read, click on "printable page" for better resolution PDF files. Printable pages are best read with an increased zoom percentage. The "printable page" PDF files are best viewed using Adobe Acrobat 6.0 or later with an optimal screen setting of 1024x768. Volcano: Elev = summit elevation above sea level; Lat/Long of volcano center in decimal degrees, N and E are positive (+) and S and W are negative (-); Erupted = last known eruption (see main legend); VNUM = number in Smithsonian data file. Impact Craters: Age, in million years (Ma), with uncertainty; (see main legend). Notable Events: 25 numbered events (see table); Red = volcanoes; Black = earthquakes; Purple = impact craters. Convergent boundaries, shown only on the interpretive map on the published map, are available here as an option. Beware, though, that many of these boundaries are broad, diffuse zones, rather than crisp, sharp junctions. National boundaries, not shown on the published map, are an option here for geographic reference. When selecting this layer, it is a good idea to deselect the "coastlines" layer, to avoid overlapping coastlines. File sorted by date within individual magnitude ranges.